I had a rather harrowing time with taxis today. We landed from a flight from our family trip to the Andamans. 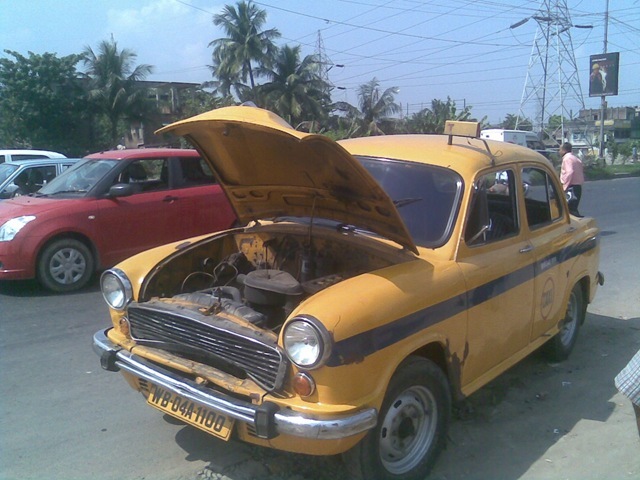 We encountered 4 taxis from there to home. We travelled in three of them, almost got on a fourth, had an accident in the first and a breakdown in the second. We took a pre-paid taxi from the airport. The guy took ages to show up with his cab. Other than that, the first part of the journey was pretty uneventful. We dropped off Ma and Didi at their offices in Salt Lake, leaving me and Baba in the car. We had gone only a short distance from there when we came to a red light. Our taxi was pulling up behind another one, which was behind another one. I was seated to the right of the back seat. I could see the stationary taxi in front approaching fast. When it was pretty close, my instincts told me that it was too close and we were still going too fast. I told myself, how can we not bump into that taxi now? We’re sure going to bump into it. 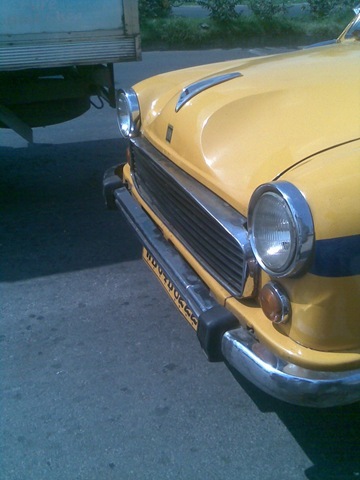 The yellow back of the taxi loomed up real fast, the brakes engaged – too late – WHAM! We were thrown forward by the impact, then back again. I kept staring. A guy in the taxi in front craned his head to look back. Our driver and the driver of the taxi in front came out to look at the damage. The rear bunk of the other taxi was bent inwards into a cavity. Our driver stood staring hopelessly at the front of his cab. We heard the radiator was broken and leaking. The other cars pulled away as the signals turned green. We kept standing. One would think from these two photos that I had taken an earlier photo of our taxi, before the accident, but that would be a laughable idea. It means I’ve simultaneously got power to see the future and the stupidity to photograph a taxi doomed for an accident and get in it, instead of taking another taxi. I was still wondering what caused the brakes to be engaged so late. It was either a brake fail, or the driver was unmindful or drugged or something. After some talk we got on one of the other taxis. For some reason, our pre-paid taxi driver paid this guy nothing and told us to pay 120 bucks to him, and Baba agreed. So we got on it. We had hardly travelled for 2 minutes when our driver reported that the taxi won’t be moving any more, that it’s brake had also failed. We got out of the taxi, and I saw brake oil oozing out of the side of the wheel. Thankfully, there were a couple of taxis standing there. Our driver talked to one of them, who agreed to take us home for 120 rupees. But we were about to put our luggage in his bunk when another taxi driver came out of nowhere and stopped us. He said that this guy cannot take us as it was a taxi stand and that guy’s taxi did not belong to the stand. Baba was pretty pissed off by now. However, we got on this new guy’s taxi. The rest of the journey home was uneventful, except that I found that I had developed a new sensitivity to any car that happened to loom up in front of us, and would blink uneasily at it till it found its place in a safe niche around our taxi. P.S. When we reached home, the meter showed 94 bucks, whereas Baba had to pay 120 bucks because of his prior agreement. What a day.